Objective: Defend your base!! Upgrade your archers, hold your horse and kill some zombie! Medieval Defense Z is a fun zombie game. 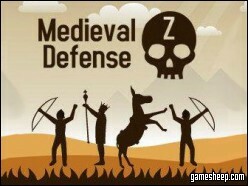 We are glad that you have chosen to play Medieval Defense Z on GameSheep.com, the most dynamic website available. If you like this game Medieval Defense Z don't forget to rate it and this way you will help with selecting only the best games for the home page.